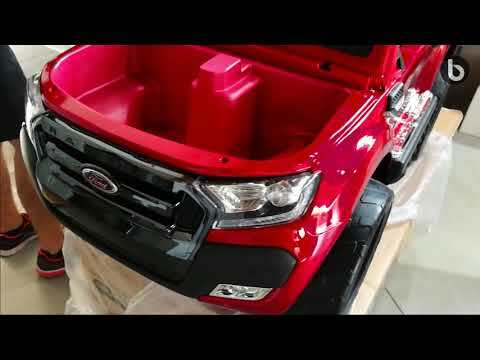 Kids electric ride on car Ford Ranger Wildtrak 4X4. Features: Toy car has quality materials and workmanship, 2.4 GHz remote control, 4X4, LCD screen for playing music, bluetooth connection and playing favourite videos. It has two stitched Leather seats, making it suitable for two children. Soft EVA wheels for comfort and durability. The toy car is also equipped with headlights and illuminated deck. 2 buttons fancy horn playing pop music, Bluetooth music player, volume and sound effects control. For the safety of the child there is adjustable seat belt installed. 4 x motors drives 4 wheels, 3 forward and 1 reverse speeds, thanks to this is suitable for off-road driving. This car does not require additional maintenance except charging and occasional cleaning. By driving this fantastic car your child will be in the center of attention. Bluetooth connection with ability to control the music volume. Package includes Adapter with indicator + rechargeable battery. Specs: Dimensions (L x H x W): 139 x 81 x 83 cm. Weight: 28 kg. Max. Load capacity: up to 35 kg, tested 55 kg. Speed: 3 - 7 km/h. Drive: 4 x 45 W motor, 2 x 12 V/7 Ah batteries. Charging time: 5 - 8 hours. Drive length: 2 - 3 hours, depending on the weight and the terrain. Age category: 3 to 8 years. Colour: Red. Do you own Beneo Electric Ride-On Toy Car Ford Ranger Wildtrak 4X4 Red or have you had a chance to try it? Autíčko vlastníme, šlo dle videa lehce a rychle smontovat. Baterie byly nabité, takže ho děti ihned vyzkoušeli. Má sílu přejet obrubník, mez i s 2 dětmi ( 34 kg). Některé díly mají zemědělské vůle (volant, kola), ale třeba dveře drhnou a musí se přizvednout. Některé díly bych vyztužil, ale to může být můj názor. Celkový dojem je chvalitebný. Cena dobrá, vzhled atraktivní, pro dvě děti dostačující (5 a 2 roky), 4 motorky mají sílu.